Kitka is an American women’s vocal arts ensemble inspired by traditional songs and vocal techniques from Eastern Europe. Dedicated to developing new audiences for music rooted in Balkan, Slavic, and Caucasian women’s vocal traditions, Kitka also strives to expand the boundaries of folk song as a living and evolving expressive art form. Kitka’s activities include an Oakland-based home series of concerts and vocal workshops; regional, national, and international touring; programs in the schools; recording, publication, and broadcast projects; master artist residencies; commissioning; community service work; and adventuresome collaborations. 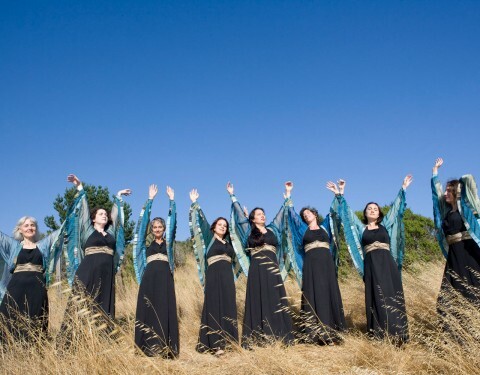 Founded in 1979, Kitka began as a grassroots group of amateur singers from diverse backgrounds who met regularly to share their passion for the stunning dissonances, asymmetric rhythms, intricate ornamentation, lush harmonies, and resonant strength of Eastern European women’s vocal music. Under the direction of Bon Singer from 1981 to 1996, Kitka blossomed into a refined professional ensemble earning international renown for its artistry, versatility, and mastery of the demanding techniques of traditional and contemporary Balkan, Slavic, and Caucasian vocal styling. Under the co-direction of Shira Cion, Juliana Graffagna, and Janet Kutulas since 1997, Kitka has grown to earn recognition from the National Endowment for the Arts, Chorus America, and the American Choral Directors’ Association as one of this country’s premier touring vocal ensembles. In addition, many international musical authorities consider Kitka the foremost interpreter of Balkan and Slavic choral repertoire working in the United States.